Available for the first time in simplified Chinese, The Study Skills Handbook helps you to develop the skills you need for higher level study, to obtain a good degree and plan for your future career. An international bestseller, the book is ideal for Chinese-speaking students embarking on a course at an English-speaking institution. Using a unique combination of mindfulness-based techniques and study skills, this book shows students how to apply mindfulness to their studies and everyday life in simple, practical steps. This highly practical book will inspire and motivate students to shape new habits and develop a winning approach to writing. This engaging book will inspire and motivate students to shape new habits which will boost their employability and prepare them for their next steps. Spanning the whole international student journey, it will help students to recognise potential challenges, connect with other students and take action that will prepare them for life after their study abroad adventure.This is an ideal resource for any student who wants to make the most of their time studying overseas. This practical book will inspire and encourage students to shape new habits and make stress-management a natural part of their everyday routine. It shows students how to recognise helpful and unhelpful stress, identify their stress triggers and develop coping mechanisms to ease and manage stress. This book will inspire and motivate students to shape new habits and make effective use of time in their studies, work and everyday lives. 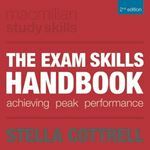 Fully revised for the fifth edition, it contains everything students need to succeed. This is an invaluable resource for undergraduate students of all disciplines, and is also ideal for postgraduates, mature students and international students.